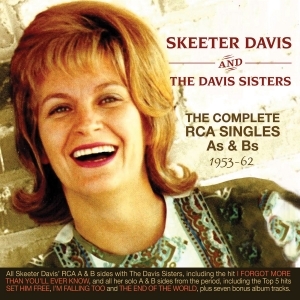 Country star Skeeter Davis enjoyed a chart career that lasted nearly a quarter of a century from the early ‘50s through to 1976, her personality and the quality of her voice enabling her to successfully adapt to the changing idioms within the genre. Coming to prominence in the pop charts as she did with the iconic hit “The End Of The World”, many fans may well be unaware of the dues that she paid before that major success which saw her almost top the US pop charts. By the time that classic record was released towards the end of 1962 – it is in fact the last single to be featured in this collection - she had already had a significant career focused purely on the country market, recording initially with her friend Bette Jack Davis as The Davis Sisters and then, after a break of a couple of years, resuming her career as a solo artist in 1958. This great value 61-track 2-CD set comprises the A and B side of every single she released on RCA from her 1953 debut as part of The Davis Sisters and then as a solo artist through to the end of 1962, plus seven bonus tracks selected from her two solo albums from the period “I’ll Sing You A Song And Harmonise Too” and “Here’s The Answer”, the latter trading on her success with “answer” records like her debut solo hit “Lost To A Geisha Girl”, and the Top 5 hits “(I Can't Help You) I'm Falling Too”, and “My Last Date With You”. It features her 1953 debut country No. 1 as The Davis Sisters “I Forgot More Than You'll Ever Know”, plus her twelve solo hits during the period, including the Top 10 successes “Set Him Free”, “Optimistic” and “Where I Ought To Be”, and ending with the classic “End of The World”. It’s a thorough overview of her first decade as a recording artist, which set the scene for a long and successful career.